Andi B. Goode: I'm your ch-ch-ch-ch-ch-cherry bomb! I've found that, more and more, I am leaning towards almost exclusively buying vintage and secondhand but that doesn't mean that I don't buy the occasional new thing. 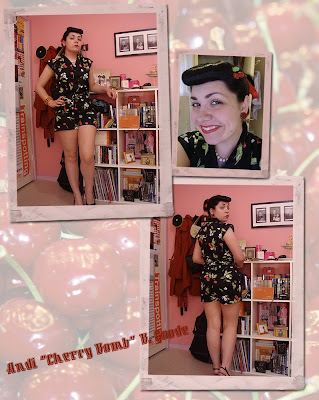 This 'Cherry Bomb' playsuit by Revival was just too cute to pass up! Outfit details: cherry brooch (in hair) - gift; necklace - Fisherman's Wharf Markets; 'Cherry Bomb' playsuit - Revival from Dangerfield; Shoes - KMart. I think I may have mentioned before that I don't usually like to show much leg (I have a strange notion that knees are slightly obscene - I hope I don't offend anyone else who has knees by that statement, don't get me wrong I'm glad to have them, it's just a quirk of mine) but when something this cute comes along, a girl can make exceptions! I just realised that you can't see my shoes, properly! Oops. You can see them on the unedited photos on my flickr. PS I've also just realised I was one of the wardrobe_remixers o' the week! If only dangerfield stocked men's jumpsuits! Your legs looks really nice! Don't hide them... :o) But I know I have the same thoughts about my knees. Its so cute Andi! Perfect for summer, i love the cherry print. You've got great legs ... I say flaunt them. And there is no way better way to flaunt them than in a cute romper. Great guy! Oops ... I mean buy! it's so cute! and you look great in it! Oh hell yes! You look stunning in that jumpsuit! I think this might be my favorite look for you so far. Cute play suit, you look darling! and I freakin love that song! I haven't heard it in sooo long! Thanks for the clip! Oh my god! That is just too cute! what a pretty jumpsuit. and your hair looks divine! Super cute romper, you look stunning. Love your bangs as well. Andie, andie - I must agree with previous commentators - this really suits you ! ADORABLE! That fits you SO well. Well done, you! So many comments! Gosh! Thanks so much to each and every one of you. Thank you again so very much for all of your deeply kind comments - it's always a joy when you stop by! Andi you have perfectly lovely legs, don't obscure them! That is too cute. Oh gosh and every time I see a picture of you and your fabulous hair it reminds me I have to get a bun roll n try it myself!